Guidance on How to Select Your Coffee Packaging Bags? Coffee packaging is what keeps your coffee beans fresh for a longer time, so it’s important to make a good choice when selecting suitable coffee packaging. Here we would like to share four crucial factors about choosing coffee packaging bags for your reference and hope these suggestions will be helpful to you. 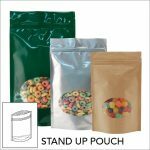 Stand Up Pouch As a familiar type of packaging, stand up pouch is shaped like the can and with the doy bottom and flat at the top. It can be resealed cause it has a zipper. The bottom allows it to stand up nicely and also makes the product stand out on any situations. All these features impressed the customer that the product they buy is worth it. Side Gusset Pouch This is a more traditional style of packaging which is very economic and easy to use. Side gusset pouch is now applied to many retail packaging in larger capacity. Although the pouch can’t stand up well but it’s typical appearance will let you have a solid feeling when you hold it. Otherwise it’s typically closed by rolling up and then using a label after sealing but normally a zipper is not applied here. Block Bottom Pouch As a newly pouch type, its square appearance nearly makes it similar to a box, which gives it pretty stand-up properties and excellent marketing potential. It also provides you a lot of potentials regarding zipper, specifications and designs, therefore quite a lot of companies would choose this type of pouch to be the coffee packaging. For different types of pouches, you can add some accessories on your pouch to gain the pouch’s functions, such as zipper , valve and Tin Tie. Degassing Valve You may commonly see that there will be valve on most of the coffee pouches, this degassing valve can ensure the pouch-venting and lets CO2 out of the bag effectively and without breathing in any gases from out side. Which perfectly suits for your beans since these beans will exhausted CO2 after roasting. Zipper & Tin Tie As per a whole package of coffee beans, sometimes the customer would like to serve the portion for many times. So they also want the resealable function to keep the beans well. In this situation, you can use accessories to achieve their demands such as zipper and Tin Tie. From our aspects, we suggest that you can choose one accessory between zipper and Tin Tie to reseal the bags since both of them have the same reseal-abilities. Just a note, when your customer select a pouch, please make sure that they exactly know the application of the pouch and suggest the correct accessory to reach the “user-friendly”. In order to let users have the most practical feelings. In order to stand out from competitors, many coffee companies pay much attention on marketing and branding- one of the easiest ways to achieve that goal is by differing your packaging. Unique and creative design could hugely impress customers, attractive appearance is also the gist to establish your own style. Furthermore, picking different varnishes, metallic colors and various accessories such as valve, zipper and Tin Tie will also distinguish your products from others. Additionally, enhancing user experience is also one facet you can focus on, for example, applying laser score on the pouch can make the pouch much more easy to open! Labels are favored by specialty coffee companies. As you may need to manage different coffee beans from various origins and lots throughout the season, so you need a nice label to finely describe the products such as processing method, date of roasting and also the information about your coffee beans. Regarding inventory bags, you can apply the complex labels with pre-printed logo and introduction of your company on the bags to gain the richness of the bag. Matching your label with alright pouch’s texture is also one aspect you should consider. Matte style labels and paper labels are more suitable for matte surface bags. Shiny label blends nicely with a matte shinny bags. For customized bags, you can print the labels directly on the pouches along with your own designs. This unified the whole pouch’s appearance compares to print your own labels then stick them on the pouch. By gravure printing, even it requires cylinders, while you can use up to 10 colors complex draws for printing. Which can help you better illustrate your ideas and also fulfill your marketing needs.